Through engaging gameplay and challenging analysis, the Excavate! games take kids on archaeological adventures through time. DIG-IT! 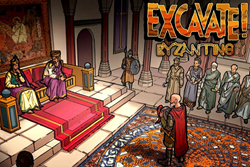 Games, a mission-based, independent developer of mobile games and award-winning interactive learning tools is pleased to announce the latest expansion of their long-running Excavate! social studies and archaeology series. Byzantine is the sixth civilization added to the series, joining the prior five civilizations: Rome, Egypt, Mesopotamia, MesoAmerica, and Greece. Excavate! Byzantine, like its predecessors, includes C3-aligned gameplay and companion teacher resources. It is available on the web, Android devices, and iOS devices for $3.99 with bundle pricing available upon request. Get it on our site, the Apple App Store, Google Play, or the Amazon Appstore. The Excavate! games are designed by former middle school teacher and DIG-IT! Games CEO Suzi Wilczynski. Through engaging gameplay and challenging analysis, the series aims to take students on entertaining and educational archaeological adventures through time and around the world. Using archaeologists’ tools, players will uncover real artifacts from ancient cultures. The game gets players immediately in the dirt evaluating the proper tool to use while learning about the scientific process of excavation. Players are exposed to concepts such as stratigraphy, context and the importance of proper recording. Analysis then takes center stage as players learn about the significance of the artifacts they collect and gain a deeper understanding of ancient people through what they left behind. Each civilization includes 3D artifacts and detailed illustrations of ancient life to immerse the user in each unique culture. Each civilization is a stand-alone game focused on a specific culture and time period. These “chapters” will have players exercising their inquiry and deductive reasoning skills as they explore cultures both long past and more recent at sites ranging from the Bronze Age to the Americas. The Excavate! series gives players insight into the full spectrum of human history across the globe. The digital games are joined by the Excavate! Card Game with official decks for the Roman and Egyptian civilizations and printable PDF cards for the other four. Take the learning off the screen and reinforce the knowledge students gained in Excavate! by having students connect people, places, and artifacts together in various, historically accurate ways. These educational games are suitable for grades 3-8 and correlate to Common Core State Standards (and equivalents) for ELA and The National Council for Social Studies C3 Framework. The game includes the new educational game and app learning analytics standard GBLxAPI, which is improving learning data reporting in educational games and applications. All current and future versions of the social studies video games now include HTML5, iOS and Android versions, supported on the most recent browsers and available on the Apple App Store, Google Play, and Amazon Appstore. They are available immediately at the Dig-it! Games website store and the respective app stores. Bulk purchase discounts are available. Learn more about how this game can become part of your world history lesson plans by joining our teacher network where you can review the game for free. About DIG-IT! Games: Dig-It! Games is an award-winning, mission-based game development studio dedicated to creating games that encourage kids to explore the world around them. Founded by professional archaeologist and former middle-school teacher, Suzi Wilczynski, Dig-It! Games develops educational tools that promote critical thinking, independent learning and cultural understanding. All games incorporate age-appropriate content in math, science, social studies and language arts into fun interactive and engaging learning experiences.